Burn victim cases are complex. The effects of a burns on children and adults alike can be devastating and even deadly. Burn victim cases also involve severe emotional distress that may result from the burn and the permanent scarring that follows. burns resulting from post-car accident fuel-fed fires or explosions? By most accounts, the excruciating pain and psychological trauma of disfigurement that a third-degree burn victim suffers is unimaginable. In addition to the initial trauma suffered, serious burn injuries require ongoing lifetime care, rehabilitation, and surgical procedures. For this reason, it is imperative that a thorough medical analysis is conducted to fully evaluate the injury’s effect on the individual’s life and future. Burn victims may suffer: muscle, bone, blood and tissue damage as well as subsequent pain due to injury to nerves. Burns can also be fatal. Depending upon the severity of the burn as well as the location of the burn, a burn victim may experience a wide number of potentially fatal complications, including shock and respiratory distress. Burns can also result in severe psychological and emotional distress related to scarring and deformity. Third Degree Burns: The most serious burn injuries. Third degree burn injury will cause permanent tissue damage as well as major damage and deformity to all layers of the skin. Third degree burns usually require skin grafts or plastic surgery. Injured third degree burn victims are typically flown immediately to a local burn center. There are two main kinds of burn treatment surgeries to repair burn injuries: acute and reconstructive. Acute procedures occur right after the injury, and are performed by a group of trauma surgeons with experience in acute burn care. Burns with the potential for complications almost always require a plastic surgeon to help oversee inpatient and outpatient care. Burns that cover a large area of the body or that cover critical body parts should be dealt with at a verified burn treatment center. Burns that are less severe can be managed as an outpatient. A patient may need to have reconstructive surgery because the original burn injury has healed. This type of operation is typically performed by a plastic surgeon. The main goal with this type of surgery is to improve mobility at the site of the burn and to improve the overall cosmetic appearance where a scar has formed. Many burn victims will still need to see their reconstructive surgeon for years after the procedure. Scar tissue treatment will also probably have to continue for months before the patient exhibits signs of improvement. Unfortunately, many patients undergoing an operation understand that burn surgery will not make their scars completely disappear, but they undergo the operation to help the affected area become more functional and decrease the visibility of scars. Surgeries may also help repair setbacks affecting the eyelids, lips, and nose as well as address hair loss issues. Scars that have healed in a peculiar manner can also be augmented using various surgical and nonsurgical procedures. At The Strom Law Firm, L.L.C., we handle burn victim lawsuits in South Carolina and throughout the Southeastern United States. Our South Carolina burn victim and wrongful death attorneys have the resources that you need to properly assess burn injury cases. We understand the need to review and plan for the immediate and long-term effects of different types of third-degree skin burns. We welcome the opportunity to provide you a no cost consultation to discuss how we can help. Fortunately, South Carolina is within reach of some of the United States most respected burn centers. 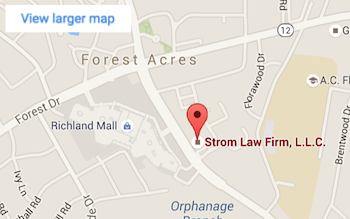 If you, your child, or a loved one has been injured or died as a result of a burn, the attorneys at Storm Law Firm can help. Founded by a former U.S. Attorney, our South Carolina Burn Injury Attorneys knows how to fight for clients. The access and working relationships we have with top burn care experts and other specialists, combined with the experience and resources of our entire firm and the passion we have for helping our clients recover, can help you to recover the full compensation you deserve for your injuries. Call today for a free appointment (803) 252-4800.